I hope you had a good Thanksgiving! It has been nice to relax. I read a whole book so far this break, and I haven't read for fun since probably September. So that makes me happy! I bought the place value pocket chart because I don't have one and I've been thumb-tacking Ziploc bags to my bulletin board........ I think this might be a little classier. I bought the rest of my calendar days which I LOVE! I am obsessed with these Poppin' Patterns days. Then I got 12 Smencils to give my students as part of their Christmas presents. Those Smencils really jacked up the total price. They'd better love them!! And here are a few other things we did for Thanksgiving this week. We were in school on Monday, Tuesday, and half of Wednesday so I tried to sneak in lots of academic Thanksgiving activities to keep their brains in the room!! We made the Thanksgiving retelling bracelets, which I found at First Grade a la Carte! They loved these things, even the boys! I had a ton of these beads at my house, so I was able to make little baggies for each kid, but I didn't have brown. I went to like 5 stores, no brown beads!!! So I explained the sad situation to the kids and told them to pretend there was one there. One intuitive kid made her own brown bead out of construction paper, haha!!!!! Here is hers. Ours didn't turn out quiiiiite as perfectly as hers did. 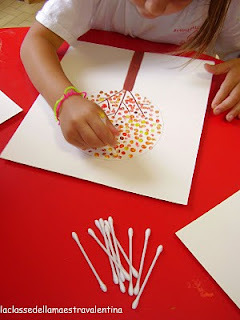 Now that I translate her blog from Italian into English, it looks like she drew a circle for their dots to stay inside. Ours were more creative-looking, and they liked doing it! At the last minute on Monday night, I saw Mrs. Sauod's post about Thanksgiving activities connected to books. I immediately replaced whatever else I was going to do with her cute suitcase idea! I read a Thanksgiving book, and then had them close their eyes and imagine that they are going on the Mayflower. Since there were so many people, they could only take 4 things. What would they take?? I thought I'd get some crazy answers, but they mostly said things like their bed, their blanket, their dog, their families, and so on. About half of them said pop. Can't survive 66 days at sea without pop, I guess!! They loved the little suitcases. They wanted to carry them all over the room, which was pretty cute. I think I'll use these again when I do Mrs. Bainbridge's Christmas Around the World unit! In second grade, we wrote acrostic poems about what we were thankful for. They had to be creative and use adjectives for some of the letters. And the last thing we did before we ran home at 12:30 on Wednesday was our award ceremony! I got these super cute thankful certificates from Erica Bohrer. I read everyone's aloud and we all clapped and were excited for each other! They loooooooved the ceremony and they were so happy with what I wrote to them. I wrote to one girl that I was thankful for her because she always made me laugh, and her face looked like I gave her a million dollars. It made me happy. :) We don't have a color printer at school so I just printed it on colorful paper. Also I am annoyed that this dumb picture is coming out sideways!!! So now that Thanksgiving is over, I guess it's time to start Christmas...? How soon are you starting with your class? LOVE the trees - I want to do some dot painting with my kids this year. I just bought smencils for my middle daughter last night - thought they'd make a GREAT stocking stuffer. I had never heard of them before.